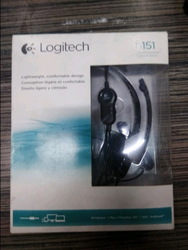 Our firm is a leading name, involved in providing a comprehensive series of H150 Logitech Headphones. With rich stereo sound and a noise-cancelling microphone, this all-purpose headset maximizes your sound and minimizes your audio accessories. You’ll enjoy full, rich sound for your movies, music, games, and calls. Our company has been successful in winning appreciation from the clients as one of the most prominent names in the trading of Logitech Headphones. In order to meet excellent quality standards, we are supplying Logitech Stereo Headset Pink.